It's a day before the Underwater Fanch-Dress Parade and Alfie has that awful feeling. It's a nervous feeling, an uncertain feeling. A not-very-brave feeling that makes the tummy go all funny. That night, he finds it hard to sleep, and when sleep does eventually descend, it's filled with heavy, underwater dreams. By the time he wakes, Alfie feels like he's been carrying the ocean. 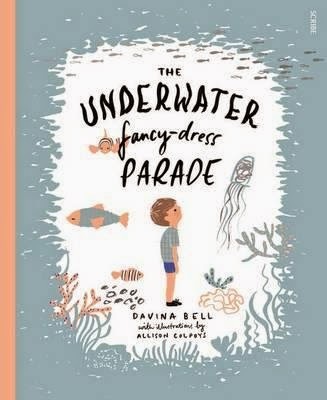 Can he push aside his fears and make it to the underwater parade? Beautifully-written and sensitive, there's not a scrap of schmaltz in this book about the anxiety that plagues some children, and even carries into adulthood. The story is embracing, gentle and patient - and ends on a delightfully hopeful (yet not certain) note that will have every reader championing little Alfie. The tenderness in this story is divinely balanced with gentle pops of fluorescent colour on soft grey pages - a carefully-pondered colour selection that works so very well. The illustrations have that yummy retro feel all ages will enjoy. A considered, charming and important book for anyone struggling with throwing themselves into the vast ocean of modern day society.